My youngest daughter just turned 12 this past week! While I was wondering where the years went; she was searching for the perfect cake for her birthday dinner. This year--the cake was a melting ice cream cone cake...and was a little more time consuming to bake and decorate than it should have been! 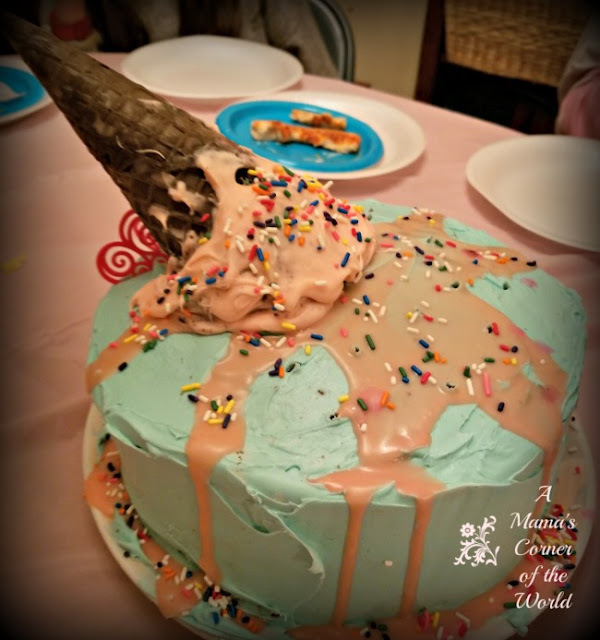 We thought we would share Birthday Cake #12 as this week's Wordless Wednesday Link Up! It is your turn to share your latest Wordless Wednesday (or not so Wordless) posts from the week! Very cool and it looks yummy. Thanks for hosting and have a wonderful week. What a cool cake! Happy Birthday! Your linky is not working for me, so I just had to stare at the gorgeous cake on your page! Oh, no! I wonder why it was acting up? I am new to Linky Tools--so hopefully it is all "fixed" now! Yummm! What a clever idea! Thank you! It was fun to make and the kids all enjoyed it! Great job with the birthday cake and Happy Birthday to your youngest daughter! That is such a neat looking cake! How fun.